Do you hear that sigh of relief? Yeah, that’s me. Sigh. I’ve finally gotten around to implementing a feature our Protagonize authors have been asking for… yeah, well, err… over two years. Yes, your stories (or poems, writing exercises, or what have you) can now end. Sounds simple, doesn’t it? Well, unfortunately not that simple, but I’ve managed to add the option nonetheless. You’ll see a new menu item in your Story/Branch Options menu on the ending chapters for your works on the site entitled “Mark as ending“. For the time being, I’ve limited this option to the original creator of the story or poem (etc.) While there are a lot of collaborative stories on the site where everyone has an equal stake in the storyline, it makes sense to let the original author act as the story’s curator, so-to-speak. They will have the final say on whether or not a chapter or branch constitutes an ending, although moderators can always change this as needed. 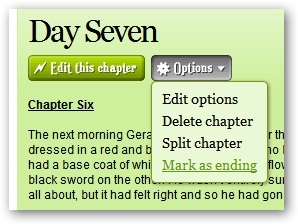 Also, if you decide to continue a work you’ve completed, you can simply unmark the final chapter (also via the Story/Branch Options menu) to continue it. Whenever you’re satisfied that it’s complete, you can mark the last chapter all over again, ad infinitum. As you can see above, there’s a new row of filter checkboxes below the normal story type options. I’ve also taken the time to fix the solo story filter that’s been broken forever. 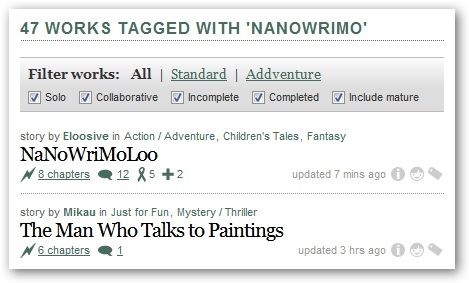 The new filters when browsing (including on your My Works page, which has a couple of additional options) will let you filter out solo/collaborative works, incomplete and completed works, and whether or not to include mature works in your search results. For the time being, mature works are included by default, but this will eventually become a profile option. The eagle-eyed among you will also notice that there is a new icon (not shown in the screenshot above) for completed stories. It’s down to the bottom right of story listings, beside the summary, tags, and solo mode icons. This entry was posted in Features, General, Site mechanics, Site updates and tagged awesomeness, endings, new features, updates. Bookmark the permalink. SWEET! Oh wait, I don’t think I’ve ever finished a single story on here. But, at least I can’t blame you for it anymore! Time to go tage come of my completed works. He He. Good stuff Nick, I think I shall go set my only finished story to complete now. Very exciting!